Oh hey, have you heard? Prince Harry’s in the US. The Daily Beast is doing rolling updates on his every move which is hilarious. Grapefriend is heart-warmed at all the pics of him visiting soldiers and stuff, but come on, all we really care about is the wine he was served at the British Embassy dinner on May 9! Let’s tackle this course by course. Scallops, avocado, lime – perfection with Sauvignon Blanc. And the fact that it’s Cakebread just makes me happier (don’t forget to enter your pics for their photo contest which I’m helping them run)! For god’s sake, if you hear veal and mushrooms and don’t sprint for a bottle of Pinot Noir I’m not sure you’ve ever even had Pinot Noir! I love Stag’s Leap and Artemis is a fantastic Cabernet of theirs, but it seems too heavy for this course. Could’ve been a fabulous opportunity to introduce Harry to some killer Willamette Pinot Noir. Pairing summer pudding with champagne is great (summer pudding is is a British dessert that’s white bread layered with red berries and fruit juice). I was a little dismayed that they didn’t go with an American sparkler, but since they did American wines for the first two courses I guess I’ll let the Pol Roger slide. It is one of the Champagnes that holds a Royal Warrant after all. Overall, good choices. But when Harry dines with grapefriend, my pairing menu will be much better. Tags: cabernet, Cakebread, champagne, pol roger, prince harry, sauvignon blanc, stag's leap, wine. Bookmark the permalink. Previous post ← skip your lunch, not your wine! Who got those pics for you ? Lovely touch. I’m with you on a Pinot Noir for the main dish… Stag’s Leap is great, but a Dundee Hills Pinot… my mouth is watering right now. Who decides their wines anyway?!? An how much is wine and how much is politics? Oh, do you know where we can get the recipes and really do a good pairing? thanks for the post! 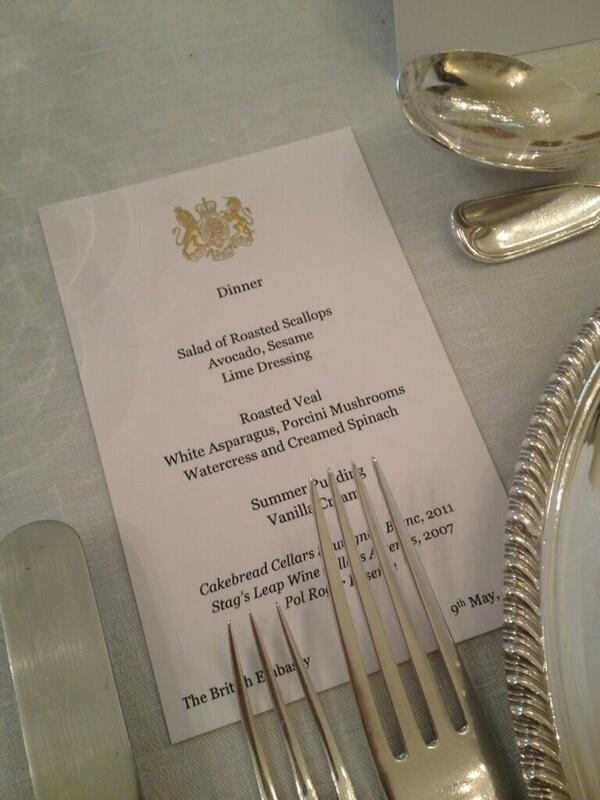 I don’t have the recipes but the next time the Brit Ambassador dude calls me I’ll ask 🙂 The White House won’t release the wines they serve anymore because people were getting all mad they were expensive, but they usually leak. Fun fun fun. What about Nyetimber instead of the Pol Roger? 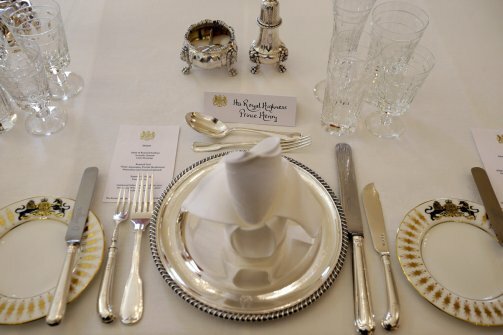 It is made on English soil and was owned by an American – symbolic of a special relationship. more importantly, it’s delicious. Cool – have never heard of that. Pol Roger was served at William’s wedding and has the Royal Warrant so I guess they played it safe instead of creative! Here is Nytimber’s website: http://nyetimber.com/. Try it if you’re ever in England. It really is very good. BA has used it as an option in First. I wish I could get it here in the USA — Japan is the only country, to my knowledge, that imports it.